Senani Hotel is located along Rajapihilla Mawatha road, more than 1 kilometer from the historical city centre of Kandy and Kandy Railway Station and 15 minutes from Peradeniya Botanical Garden. All accommodation features private balcony with views of the surroundings and furnished with air-conditioning, satellite television, mini bar, piped-in music, telephone and en suite bathroom with attached bathtub. 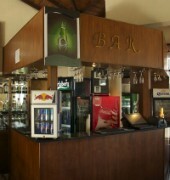 For dining option, the hotel hosts a restaurant serving a range of Eastern and Western specialties and guests can enjoy a wide variety of alcoholic and non alcoholic beverages at the bar. In-room dining is also available on a limited time. Facilities and services offered include an outdoor swimming pool, laundry service, currency exchange, taxi service and IDD facilities. Additionally, day excursions, Kandy night city tours and picnic lunch can be arranged on request. The hotel is approximately 105 km from Bandaranaike International Airport.